Survivor lives up to his name. The tiny kitten clung to the man who would prove to be his rescuer as Hurricane Florence took its toll on the Carolinas. Robert Simmons Jr. sat on the back seat of a small vessel, looking at the what was once the streets of New Bern, now canals. He had lived there for all of his life. Nothing was recognizable. 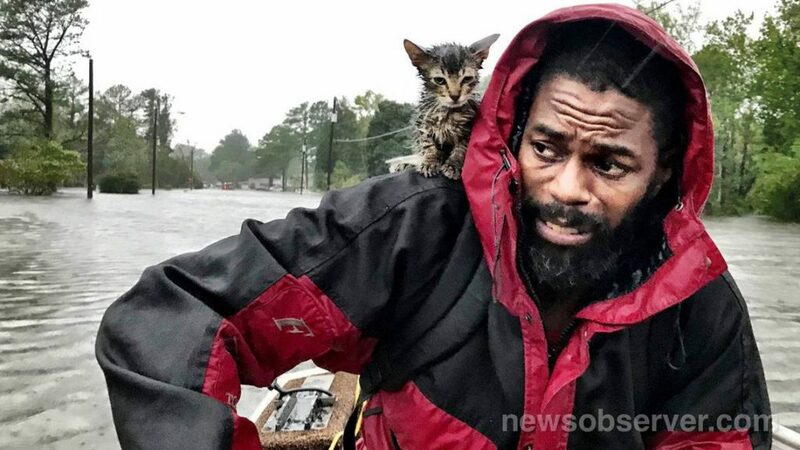 The photos of the man and the kitten have gone viral, perhaps as a little bit of hope for everyone who both went through and watched the storm. Their faces tell a story far more detailed than words alone would relay. The picture has left people in tears. Simmons had left his father in the house. He refused to leave when the opportunity came to get out. While his house was still dry, the water from the street hand come all the way up to the door. Three men showed up in a small boat to get them out as the floodwaters continued to rise. Survivor’s mom, who is feral, was also left behind. Simmons had tucked the kitten into his coat to keep him safe and dry, but the kitten had other ideas. Climbing out, he settled on the shoulder of the man who was taking him along for the ride. At the end of the journey, Simmons, Survivor still hanging on, walked toward a shelter. Now it is simply a game of wait and see. This is so hard for the animals and their good guardians who are with them and have not left them behind. I hope the mom will be okay. She being feral would not go with him I’m sure. Thank you for saving this baby sir.